Otone SoundBase review | What Hi-Fi? If it’s not the Otone SoundBase’s cheap price that catches your eye first, it’ll be its strikingly snazzy image. Soundbases aren’t particularly exotic-looking products, but the Otone’s sparkly, pyramid-studded front garners some interest. Comparable to an emo’s belt, it somehow invites you to run your fingers along it, and would jazz up most home cinema set-ups, no mistake. Tilt the box towards the light and you can just about make out two 5cm drivers hidden behind that grille. Flip it upside down and you’ll see that bass is taken care of by a single 7cm woofer. The chassis’ smooth, wood-effect finish looks beyond its price tag, but build quality leaves much to be desired – the cabinet’s a little rough around the edges, and the vinyl wrap actually started peeling away during our time with it. Upon closer scrutiny, we realised its slightly raised rubber-ended feet weren’t all fixed on straight. 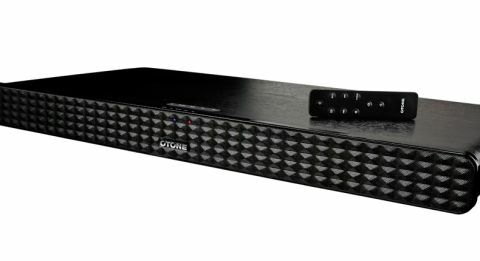 We don’t expect a luxurious build from a budget soundbase, but the Otone aches for more care. Our reference 40in Sony TV is a perfect fit for the Base, though any model with a stand less than 65cm wide and 32cm deep will be suitable. Otone claims it can take up to 80kg, so you shouldn’t have to worry about mounting a large TV on it. Analogue- and digital-friendly, it houses a pair of RCA plugs and an optical input for hooking up to a telly. Meanwhile, the Bluetooth spec comes in handy for wirelessly playing music from a smartphone. Sources – as well as volume, power and ‘bass’ levels – can be controlled via the neat strip of rubber buttons on top of the ’Base, or on the tall, almost paper-thin remote. That’s the ‘Base’ part – now onto the ‘Sound’. Even a modestly priced soundbar should produce a noticeable improvement over a TV speaker, and the Otone duly obliges. The presentation is significantly weightier than the aforementioned Sony TV’s – more solid-sounding and open too. We play Percy Jackson: Sea Of Monsters through both, but only the soundbase lets the film’s bassy elements manifest. A ‘Bass’ mode emphasises lower-end frequencies, but makes the whole presentation a little boomy. We’d leave it off. If getting more volume from your movies is a factor in investing in a soundbase, know that the Otone goes substantially loud, yet you don’t need to hit the high numbers to hear dialogue. Voices are well-projected, even if they do carry hints of sibilance. The Otone’s real issue lies with dynamics and detail. Skip to the boat fight with arch-enemy Luke, and the orchestral score’s brisk, yo-yoing dynamics come across as rather dull and lifeless. Inconsistent with the lively on-screen action, its overly safe delivery simply fails to add anything to the scene’s tense atmosphere. The Otone SoundBase starts out well with a fresh and striking design, but ends up being rather average. While expectations are fairly low at this price bracket (it’s by far the cheapest soundbase we’ve seen to date), the Otone doesn’t rustle up the detail or dynamic know-how to meet them. Whether it’s a soundbase or a soundbar, there are better options out there vying for your investment.